We don´t just wanna make you stand up, we want you to go have as much fun as possible in combination with a highly productive lesson. If you leave us loving surfing as much as we do we know we did a good job. 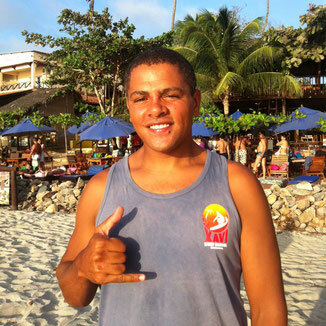 Xavier was one of the first surfers in Jericoacoara and has now made his passion his job. Teaching for more than 15 years people from all over the world he and his team are prepared to teach you how to surf in no time! If he´s not in the water you can probably find him in his workshop shaping new boards for the surf school and his clients. Wanna know more about Jericoacoara? He is always happy to share some insider tips also outside the ocean with his students. 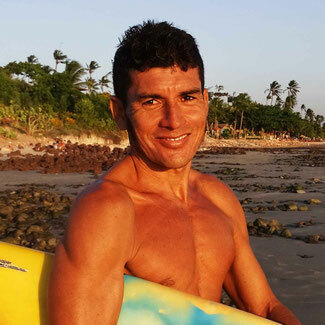 Dárcio is always in a good mood and besides surfing loves to kite and SUP. The native portuguese is happy to teach you in english or spanish as well!